CHATHAM, ON (Friday, December 14, 2018) – The Chatham-Kent Health Alliance Foundation Christmas Wish Tree lighting ceremonies took place this week at both the Wallaceburg and Chatham sites of Chatham-Kent Health Alliance (CKHA). Dozens of attendees from across the municipality braved the cold and wet temperatures to enjoy events that have come to embody the holiday spirit of the people of Chatham Kent. 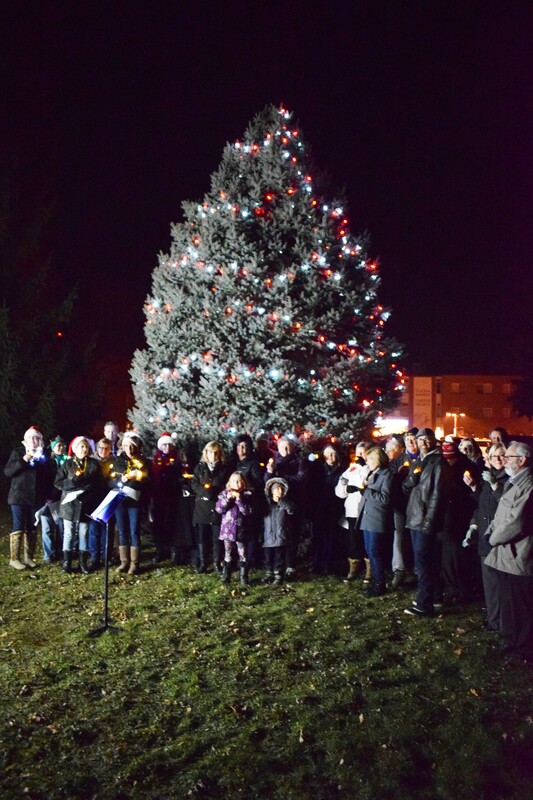 During the Christmas Wish Tree appeal, members of the community publicly honour family members and friends by making a donation to illuminate one of three different coloured tree lights in support of their local hospital, the Chatham-Kent Health Alliance. This year’s appeal and event highlighted the importance of heart health, and all funds raised are being directed toward the purchase of equipment that helps lessen the impact of heart-related ailments in Chatham-Kent. Two Christmas Wish Tree lighting events took place this year for the first time. The first was at the CKHA Chatham site on December 10th, with another at the CKHA Wallaceburg site on December 13th. The Wallaceburg event also featured a popular horse and wagon ride, which took attendees around the neighbourhood in the tradition of holiday events from the past. Fundraising for the Christmas Wish Tree is still ongoing, and donations can be made until January 31st, 2019 by visiting www.ckhaf.ca, calling 519-436-2538, or by dropping by the Chatham-Kent Health Alliance Foundation office at 9 Ursuline Avenue in Chatham. The Foundation offices will be open throughout the holidays, with the exception of Christmas Day, Boxing Day and New Year’s Day.